While VMP might be Sean Roldan’s calling card, Mundasupatti offers him the stage to make a statement of his own. 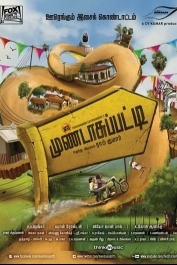 Mundasupatti aka Mundasupatti is a Tamil movie with production by Fox Star Studios, Thirukumaran Entertainment, direction by Ram Kumar, cinematography by PV Shankar, editing by Leo John Paul. The cast of Mundasupatti aka Mundasupatti includes Kaali, Nandita, Vishnu.